This month all my tropical bonsai have been thinned and cut back in anticipation of the next growth spurt. The tropical collection is substantially deduced in foliage, removing old larger leaves so that we can get smaller leaves and more ramification. Olives have been worked much in the same way this month. Best to remove old hardened leaves and let new growth use the energy from fertilizers and create more branches. August is typically a time I refine boxwood as well since in our growing season, new leaves will form into the early Fall. 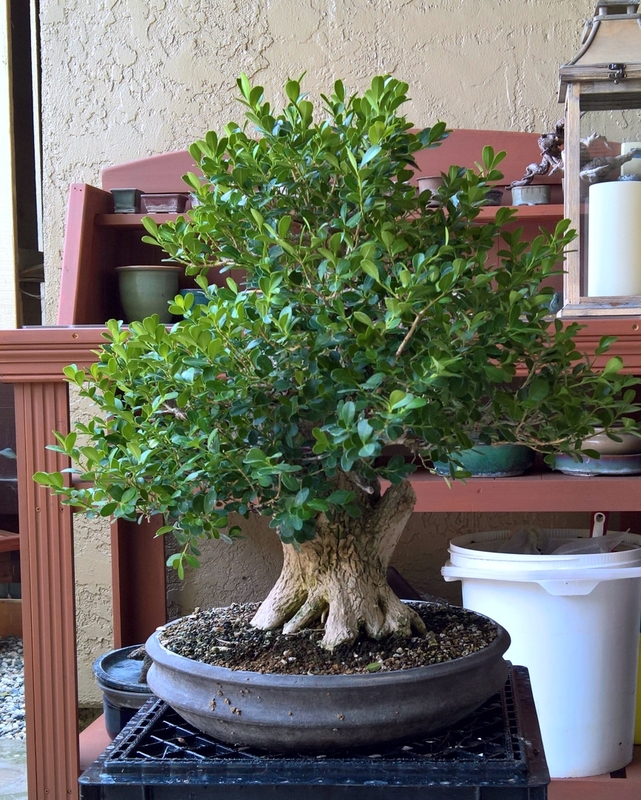 My boxwood is cleaned about twice a year, allowing for branch refinement and wiring activities. I was asked why I would so severely reduce the foliage this way. 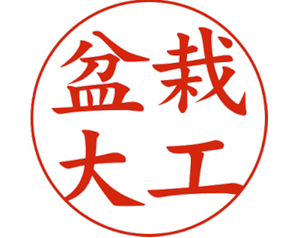 The answer is this; no natural mechanism will remove old leaves in a bonsai culture except for disease, lack of light, and pests. None of those options are good for the tree. Therefore; I reduce the leaves to allow sun, water, and air circulation through the tree. By pulling off all the crotch leaves and removing the dense foliage areas you allow the growth to be more healthy. Secondly, I open up the tree this way for wiring. It is nearly impossible to wire a boxwood with so many leaves and small branches. By removing the foliage inside the branch structure you can choose the branches for development, remove the unwanted material, and clear a path for wire. 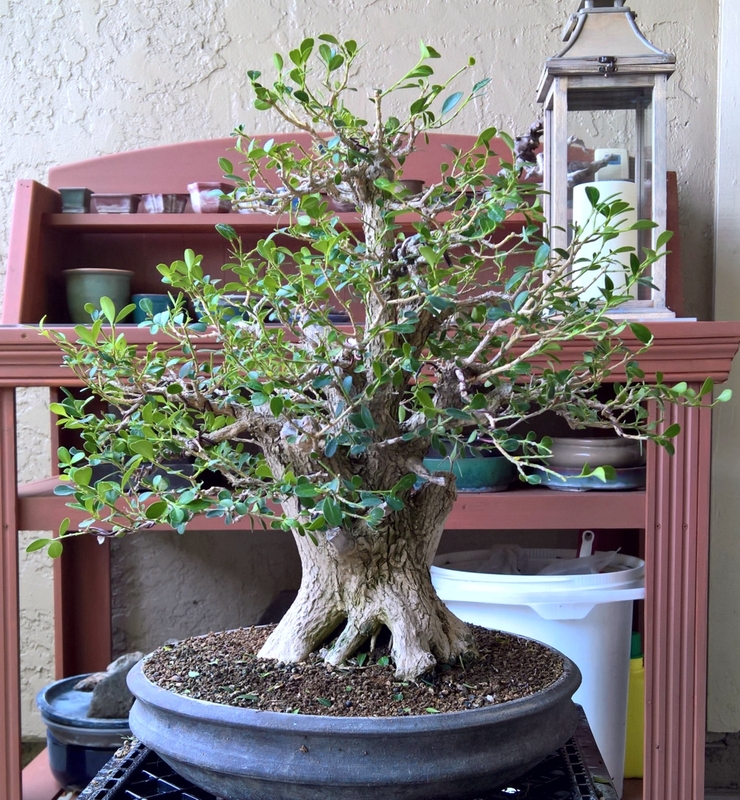 Boxwood, 2017, After leaf reduction, branch selection. This will allow clear path for wiring and branch refinement. Boxwood, 2017, prior to thinning and branch selection. Austrian Black Pine Update – Through a Wet Feb.
Japanese Iris, in progress painting. Working to develop the depth so that the flowers will pop forward. This is an example of several works I improving.